See us featured on Fios 1 News!!!! Once a month Lady Anne's Vintage Tea Room on Hempstead Turnpike in Levittown hires two women to host a Victorian tea re-enactment. The re-enactors, best friends Charla Schnupp of Floral Park and Faith Turner of Farmingdale, follow a prewritten script that is a continued story line and dress in period costume and talk about period happenings. "The script is an ongoing story, though most of the best parts are improvised in the moment; we always recite poetry, play parlor games, discuss the history and sometimes we include a time period song," Schnupp explained. "Though to be honest we usually adlib a lot; we are off script most of the time because we love throwing one another curves," Turner added. Although they have no formal acting experience, both women have been involved in re-enacting Medieval and Renaissance for several years. "For the past three years I have also been re-enacting the Civil War and WWII with my husband who is also a re-enactor," Schnupp said. After passing Lady Anne's on Hempstead Turnpike several times, Turner said she was extremely intrigued. After their first visit they pitched their idea to Girly-Ann, the owner of Tea Room. "We had wanted to do a Victorian re-enactment group tea but when she offered to hire us to host teas for her this was a wonderful opportunity," Turner said. In addition to the show at Lady Anne's, Schnupp and Turner have their own company, Living History. "We host private events, baby and bridal showers, adult and child tea and birthday parties in any time period or in fantasy dress," Turner said. "Additionally we offer dressed educational lectures to school children of all ages." Their next event will be held on Saturday, Feb. 9 at 7:30 p.m.
Lady Anne's Tea Room has been decorated with antiques, bone china, flowers and linens. They offer diners an assortment of tea sandwiches, scones, salads, sweet pastries all served on decorated cake tiers. They can accommodate large and small parties. Walk-ins are welcome, however reservations are recommended for weekends. Their Gift Shoppe offers table lace, candles, photo albums, stationery, cards and journals, home decor, unique gifts, china, home fragrance and jewelry. "You'll also find beautiful teacups, teapots, Lang cards, handmade cards, gorgeous wreaths, dried florals and decorative accessories, from Victorian elegant country, to shabby chic," its website boasts. For more information, Lady Anne's Vintage Tea Room & Gift Shoppe is located at 3711 Hempstead Tpke., 750-8283, www.ladyannesvintagetearoom.com. For more information about Living History visit http://livinghistoryservices.tripod.com/. Note: Mrs. Turner is no longer associated with Living History, though everyone here wishes her well. For a unique and entertaining experience this weekend, consider a Victorian tea re-enactment. 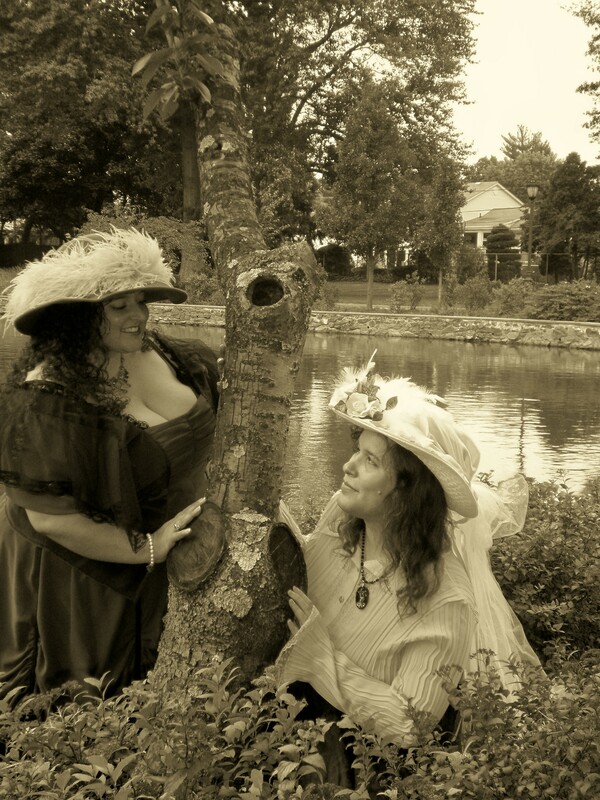 On Saturday, February 9th, at 7:30 PM, re-enactors Charla Schnupp and Faith Turner will be hosting the Victorian tea party at Lady Anne’s Vintage Tea Room. The performance includes a storyline, poetry readings, parlor games, history discussions as well as a chorus of songs from that era. Both women have been involved in re-enactments for several years, including performances from the Medieval, Renaissance, Civil War and World War II eras. So for those who enjoy a nice cup of tea, good company, and a bit of history, come to Lady Anne's Vintage Tea Room. Lady Anne’s Vintage Tea Room is located at 3711 Hempstead Turnpike, Levittown, NY 11756. 516-750-8283. More information is available on Lady Anne's the Victorian Re-enactors' websites. Ladies dressed as if they stepped out of a Victorian painting serve finger sandwiches and tea as we interact with guests speaking in the vernacular and of subject matters of the time. Victorian songs, parlor games, poetry, gossip, create a fun and interactive display that will be remembered for years to come. "Do not applaud me. It is not I who speaks to you, but history which speaks through my mouth."